There seems to be, these days, a resurgence of small coffee houses. Much the way that Starbucks came into prominence decades ago, it seems that small coffee houses are starting to gain large followings all over again with names like Stumptown Coffee and Intelligentsia. A few years back, I first heard of a growing small coffee house in the Bay Area where it seemed every Bay Area resident was gravitating towards. A small coffee roaster that supposedly made amazing coffee the way that coffee was meant to be enjoyed. A true coffee house for true coffee connoisseurs. 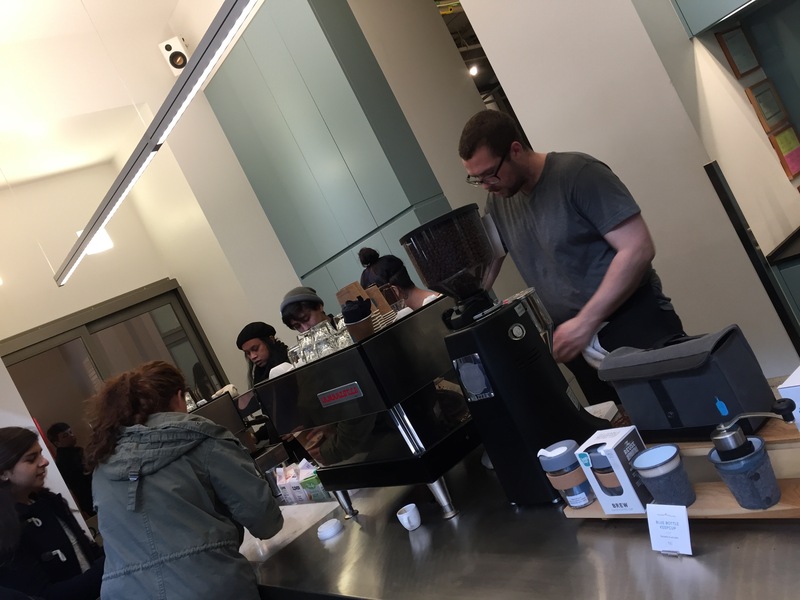 Blue Bottle Coffee was the brain child of a freelance musician who had gotten tired of specialized, flavored coffee being served at mainstream coffee houses and just wanted pure coffee. So, he acquired a small six-pound batch roaster and made a vow to open a coffee house where he only sold coffee that had been roasted less than 48 hours prior so that customers could enjoy pure, unadulterated fresh roasted coffee flavor. Today, over a decade later, operating in the Bay Area, Brooklyn and LA, Blue Bottle Coffee has formed strategic partnerships where they maintain their freshness vow never to serve coffee more than 48 hours after it has been roasted and using only the finest beans sourced responsibly. 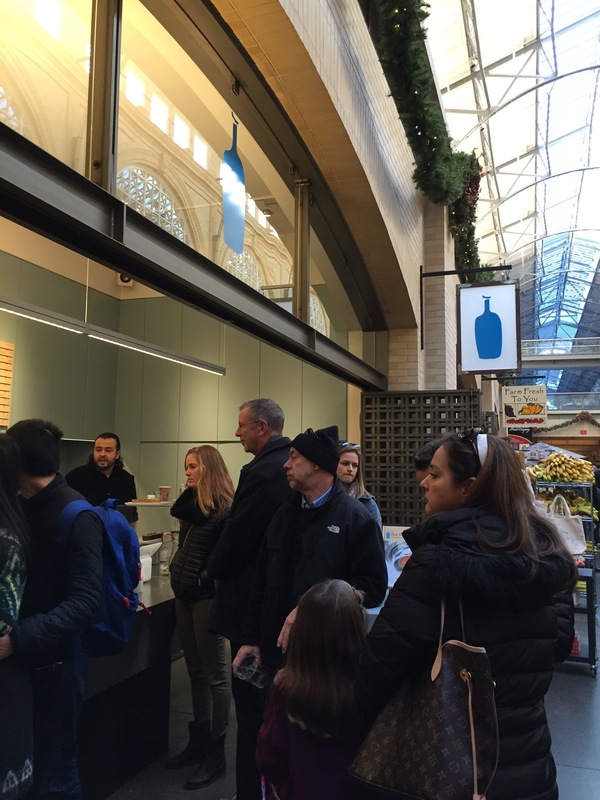 This allows customers to enjoy all Blue Bottle Coffee at the peak of its freshness and flavor. While we were walking around the Ferry Building along the Embarcadero, there happened to be a Blue Bottle Coffee inside that was hopping with customers who either couldn’t wait to get their hands on a cup of freshly roasted coffee, or saw all the other people in line for coffee and they decided they needed to see what the hype was all about. I admit, I was in this second set of people, after having heard about Blue Bottle Coffee for years, I wanted to see what the fuss was all about and I decided to order myself a cup of coffee. Blue Bottle’s menu options are very straight forward. They have drip coffee using many different types of coffee beans, and they have straight forward espresso, macchiato, cappuccino, caffe latte and caffe mocha. They also serve hot chocolate and most locations serve ice tea as well. They also serve cold brew coffee as well. They have an option as far as milk choice or almond milk, if you prefer. And that’s it. There are no flavored syrups, there are no complicated fancy drinks, it’s straight espresso-based coffee drinks made from their fresh roasted coffee beans only. When you enter the space, there’s a simple board behind the cash registers with a list of the drinks available. You place your order, give the cashier your name, then you step aside and you wait for your drink to be made. There’s a number of baristas behind the counter and they are all working a rapid, non-stop pace to create coffee art. Each drink is hand crafted, the coffee beans are ground, the espresso drips out, the milk is steamed and foamed and then poured into a cup and a piece of art is created. And it all runs like a well oiled machine to produce the drink that you desired within a matter of minutes. I placed an order for a regular latte. When my name was called, the cup I was given looked like a steaming hot, fresh made latte with a little bit of steamed milk art created by the pouring and manipulating of the steamed milk into the shot of espresso. A pretty leaf as milk art. The latte itself had terrific consistency with a strong roasted coffee bean flavor from the shot of espresso. But the milk was foamy and frothy and perfectly steamed and poured. This was definitely artisan coffee at its finest with a true latte flavor and touch. 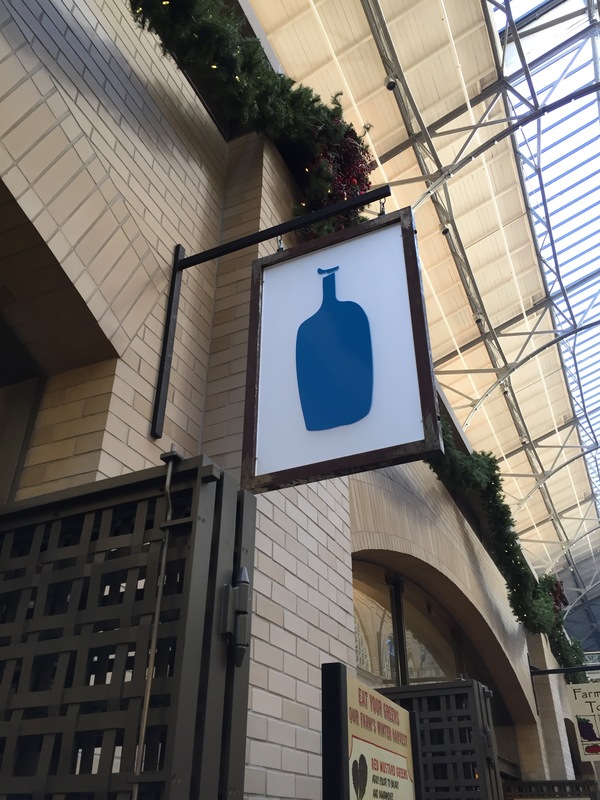 Does the Blue Bottle Coffee experience live up to its reputation? Probably, it does. The coffee is a work of art made by those who understand the art of making a great cup of coffee, plus using roasted coffee beans that are definitely of a superior quality and flavor. This was one of the more satisfying cups of coffee I’ve had in a while, and from a more commercialized coffee house rather than your local artisan coffee shops. 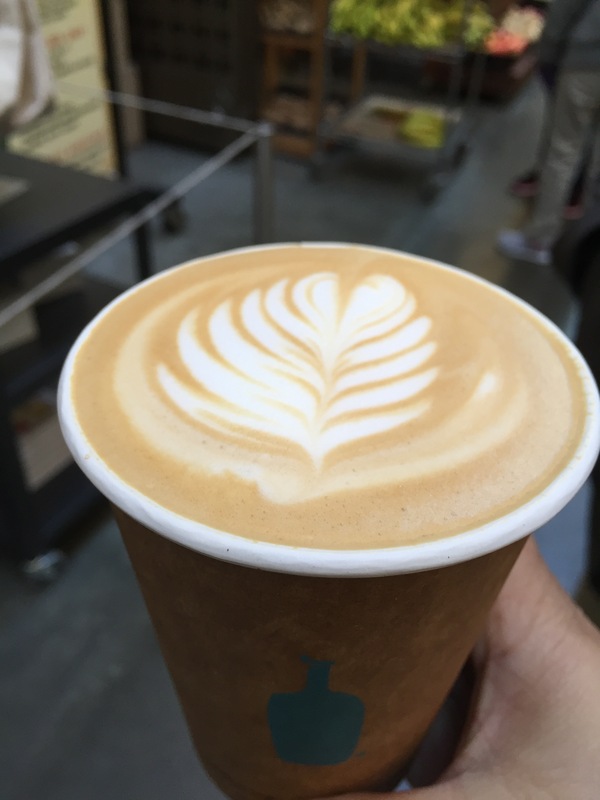 The price for my great cup of coffee was a little steep compared to how much I could pay for a similar latte at a more commercialized coffee cup, but again, that’s not how Blue Bottle Coffee bills itself and distinguishes itself from its competition. 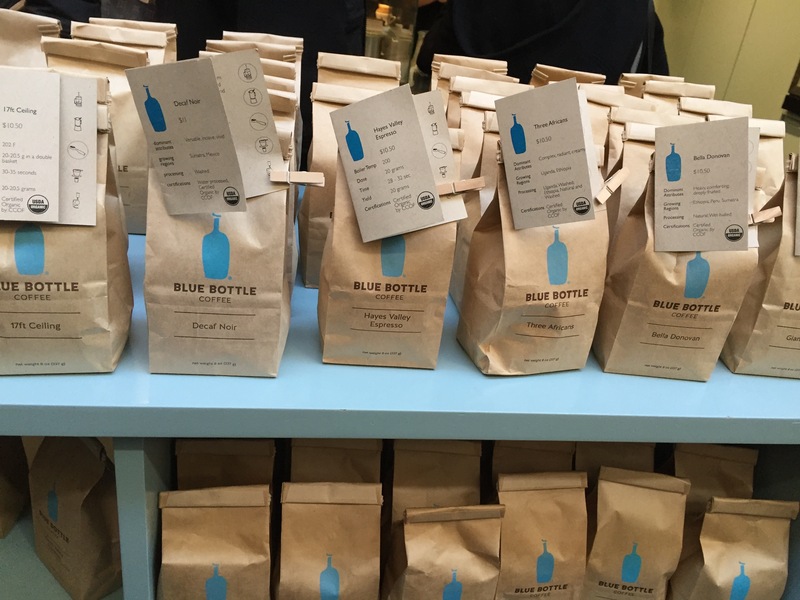 I was glad I gave Blue Bottle Coffee a try as I was curious as to what all the hype was about. While San Francisco is the original home of Blue Bottle Coffee, there is now one down closer to where I live in Los Angeles, so that gives me the option of having Blue Bottle down here. Would I go out of my way to drive there and get a cup of coffee? Probably not. But, if I happened to be in the area and wanted some coffee, I would definitely stop in to get a cup.